As some of you may have noticed I am missing some posts from my trip. I haven’t really written about Thailand or Myanmar yet. I didn’t want to write about Bangkok because it was a hard time for me, but I did it and now I can move on to Myanmar finally! I have post-dated these entries so you can search, look by date (February), by country or just follow this link. The people who have subscribed to my updates get an email when I update so if you’d like one too please fill out the form on the right-hand side of the main blog page. Enjoy! I?m not going to write too much about Bangkok. It was a completely surreal experience. Being in Thailand after so many months in China, Vietnam, Cambodia and Laos was shocking–shopping malls, a sky train and a 7-11 on every corner. It almost felt like being back home in a way and I took full advantage of that. For the past few months my diet had consisted mostly of rice, Oreo cookies and Beer Lao. Now I could choose between McDonalds, Dairy Queen, Burger King and Baskin Robbins for desert! I have no illusions about why I gained back the weight I lost in China when I was in Thailand–I ate a lot of fast food. I was hungry and homesick and in my experience the best cure for that is a trip to McDonalds and a movie. 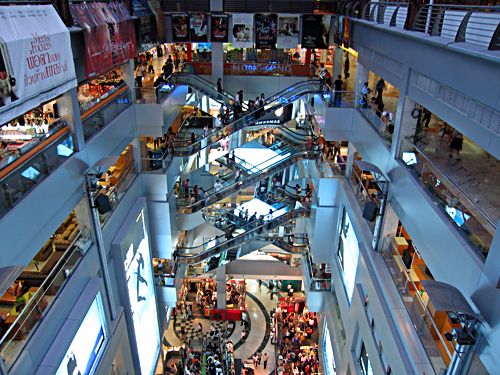 The movie theaters in Bangkok are mostly in shopping malls–glorious, sparkling, air conditioned shopping malls. I don?t think anyone can give me a hard time about enjoying shopping malls and Western food after my time in Western China and Northern Laos. It?s clear that I appreciate other cultures and want to see areas off the beaten path but sometimes I just want to order a meal and know exactly what I will get. The great part about Thai movie theaters is that they have assigned seating. When you buy a ticket you walk up to a woman behind a glass enclosure–much like in America–and she puts her hands together in a prayer position or “wai” (even Ronald McDonald wai?s in Thailand. ), bows, smiles and says ?sawatdee.? You tell her the movie title and time you want and she brings up a computerized seating chart on a screen in front of you where you can pick your seat. This is great if you want to get a good seat but don’t want to wait in line. Your ticket is printed with your seat number and an usher brings you to your seat. Typical previews play first followed by an announcement to stand for the Thai National Anthem. Everyone stands and actually pays attention while “feel good” images of the king helping the poor and holding babies flash across the screen. The Thai reverence for their king is interesting. It is the only SE Asian country to not fall under imperialist Western rule and has a stronger national identity as a result. The king has no real power, much like England’s system, but his face is plastered all over the country. Western movies are shown in their original English with Thai subtitles so it’s easy to watch. I found that I laughed at jokes before anyone else and some references passed over the rest of the audience but it felt like being back home in a 30 screen megaplex with stadium seating. Thank you for being so patient with me. I know my updating of this site has been really slow but I’ve finally got December all wrapped up and online. I’m working on the rest of Laos, Myanmar and Thailand, I swear! It’s hard to stay in my hotel room and write when I feel like I should be out seeing sites and eating fried noodles. I’m in Bangkok at the moment, weighing my options and looking into plane tickets. I’m not quite sure what the future holds for me on this trip but I will keep you updated as soon as I figure it out myself. The border at Huay Xai, Laos was hectic with people of all ages crossing from Thailand into Laos. Most people use Thailand as a base and cross over to Laos for a few days. I used my entire one-month visa and felt like I rushed through. After stamping out of Laos I walked down to the river and paid a small boat to ferry me across the Mekong to the Thai side. Visas for Thailand are free for just about everyone and the process was easy. I shared a tuk-tuk (3-wheeled taxi/motorcycle) to the bus station and literally ran and hopped on the bus leaving as I arrived. The bus was almost empty and was hauling no produce or livestock–shocking after one month in Laos. Two hours later I arrived in Chiang Rai, a city in Northeast Thailand. Most people skip this city but I felt the need to settle down in Thailand and get some Western culture in my system before going any further. Walking from the bus station I stopped and asked a man sitting outside a Belgium restaurant for recommendations on where to stay. He suggested I walk out of the town center to a particular hotel. I found it overpriced and grungy but nearby another hotel which turned out to be great. There was a restaurant and courtyard with tables and hammocks but the best part was the rooms. I stayed in two different rooms–one was a private building with a mirrored vanity decorated with animal heads and rifles. The second had a small gravel patio and huge bunk beds. Both had their own bathrooms with gravel floor and plants growing around the fixtures. Although it might sound strange, I was really happy to be surrounded by decoration. The brightly colored walls were enough to make my day after five months of white walls.